I used to have a website called, "My Left Hip," that told the story of my disability and surgery. I took it down last fall because I didn't want to identify with disability anymore. As I told a friend of mine recently, it feels like all of that happened to someone else, long ago. I had a lifetime of difficulty with my left hip and leg, often accompanied by low back pain. Seemingly out of the blue, I would have muscle spasms in my back, shooting pains down my leg, a catch in my hip, and at times my leg would go out from under me when I took a step. I started experiencing acute episodes like this when I was 20, which were followed by stretches of time when I felt fine. When I felt good, I thought maybe I was over it, whatever "it" was, but my condition gradually worsened. By the time I was in my 40s, I remember getting up almost every morning, walking across the floor with some amount of stiffness and discomfort and thinking to myself, "Someday I'm going to have to find out what is wrong with me." But in a short time, the pain subsided, I forgot about it and went on about my day. There came a time, however, when the pain did not go away. In the spring of 2001, I had one of my familiar episodes. I tried all the tricks I had learned over the years to "fix" it, but nothing brought me relief. It took several years, with ever increasing disability, but I did finally find out what was wrong with me. And shortly after I had given up on cures, and made up my mind to have the best life I could in spite of my condition, I learned about a surgical option that could change my life. 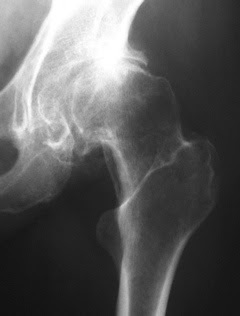 In November of 2008, at the age of 59, I had hip resurfacing surgery to repair my left hip joint. Today I am walking normally, without a cane. It is a miracle. Because I did not have a total hip replacement, people often ask me questions about my surgery. For me, resurfacing was a good alternative. It offers many advantages, particularly for younger patients. It isn't for everyone, however. People with osteoporosis, for example, might not be good candidates. That said, keep in mind that the total hip replacement is a procedure that most orthopedic surgeons feel very comfortable with. They have performed these surgeries many times and the success rate is good. The resurfacing surgery is more difficult to perform and not many surgeons are trained for it. When you ask about options, be sure to get an opinion from a surgeon who has experience with both procedures. Surgeons who lack experience with resurfacing may be inclined to steer you away from it in favor of what they prefer. 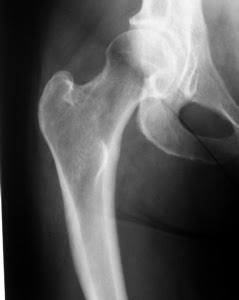 Here you see a normal, healthy hip joint. It happens to be mine - on the right side. And here you see my left hip before surgery. You can see that the head of the femur is deformed and slightly dislocated. Here is my left hip after having a procedure called Birmingham hip resurfacing (BHR). This technique, developed in Birmingham, England, has been used successfully in various parts of the world since 1997, but was not approved for use in the US until the summer of 2006. 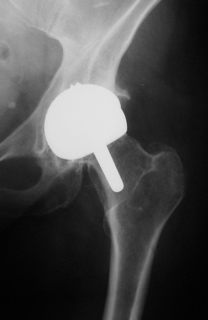 The video clips below explain how this procedure differs from total hip replacement. One of the reasons I chose this procedure is because I didn't want the top of my leg bone cut off, which is what happens with a total hip procedure. Resurfacing is less invasive than a total hip replacement, recovery time is shorter, and it doesn't involve permanent restrictions on activity. This last item was particularly important to me because my favorite exercise is taking long walks. When I found out that fitness walking is discouraged after a total hip replacement, I knew I wanted to find another procedure. Every time I put on my walking shoes and head out the door, I'm glad I took the time to find the right surgery for me. I highly recommend my surgeon, Dr. James Pritchett, in Seattle. He has many years of experience with various types of joint resurfacing procedures and he did a splendid job for me. My surgery was performed at Swedish Orthopedic Institute, which is about as nice as a place can be and still be a hospital. Every patient has a private room. The staff is wonderful. The food is great and you order it like room service. If you have to have a surgery, this is the place to have it! For more patient-to-patient information, I suggest that you visit Pat Walters' comprehensive site, Surface Hippy. Finally, there are many products available that can make your life easier. If you need a cane, get one and use it. Don't let vanity get in the way of taking care of yourself. There are other products, many that you may never have heard of or seen, that help, too. For a long time, for example, I depended on elastic shoelaces to get my walking shoes on. A sock aid made it possible to get socks on my feet when I couldn't reach my left foot. Here's a fun little video that shows you how to use a sock aid. For more ideas, see the article "Gardening with Disabilities," on my Seattle Garden Ideas blog. Whatever your situation or challenge, I wish you all the best in your journey back to health. Miracles can happen! I had an apartment for rent. It was a sweet two-bedroom place in a beach community. Built in the 1920s, it had bead-board ceilings, tiny closets and a huge front deck with a view of the water. Its charm and location had always made it easy to rent. Except for this time. It was high summer, that time of year when everyone wants to live at the beach. I showed the apartment to countless prospects, lowered the rent a couple of times, heard many glowing compliments about the place, but still I had no renter. After weeks of this, I realized that I had not been very "on purpose" in my approach. I hadn't taken the time to set some intentions about who I wanted for tenants. So I took a few minutes to think about that. I decided that I wanted a couple living here. I didn't care if they were straight or gay. Young or old. Or what their ethnic backgrounds were. I simply wanted tenants who were happy with themselves as individuals, and as a couple. No drama. Once I decided that, I waited to see who would show up. She ran an ad on craigslist that night and right away got a response from a man who was eager to find a place near the beach. She had had male roommates in college and didn't see his gender as a problem. So they met for coffee, talked about their lifestyle preferences and decided that they could make the roommate situation work. She called me to say that he would contact me to set up a time to see the apartment. As soon as I met him, I liked him. We did the apartment walkthrough and he took a rental application to fill out. After he left, I thought, "Hmmm, if he's not dating anyone and she's not dating anyone, these two would make a great couple." Then I laughed and shrugged off the idea. The important thing was that I had finally found good tenants for my apartment. A few weeks after they moved in, they had a house warming party and invited me to join them. After I was introduced to their friends and families, I got something to eat and started looking around at the way they had decorated the apartment. I began to notice photos of the two of them here and there and in each of them, they seem to be standing a little closer to each other than roommates ordinarily would be. I have to admit that I hadn't completely let go of the idea that they would make a great couple. So I chalked this observation up to my imagination, until I saw hinged frames with a photo of the two of them on one side, and what appeared to be a poem on the other. The title of the poem was "An Ode to Craigslist," written by the male roommate. In it, he thanks the online service for bringing him not only a wonderful roommate, but a woman who is so much more. As I continued to read, I felt the tears well up in my eyes. I realized that I got what I had asked for. Not quite in the way I expected, but in a way more wonderful than I would have imagined. I was looking for people already in a good relationship to come rent the apartment. I never dreamed that two bright, happy individuals would rent the apartment first and then become a joyful couple. As long as they lived in this building, I felt that there was a happy little glow about the place. It was a bittersweet day when, just before their lease was up, they came to tell me that they had bought a house and were moving out. I was happy for them; they were so excited to move into their first home. I was also sad to see them leave the beach house. On Christmas morning of the year they moved out, they came down to take a walk along the beach. He suggested that they walk by the beach house for old times' sake. And here in front of the building, he asked her to marry him. She said yes. They rang my doorbell to tell me the news. I cried. Fast forward a few years -- their daughter is now 3-1/2 and I get to see her often. We spend time at the beach where she builds sand castles and hunts for pretty rocks. She is a beautiful little girl and I feel so fortunate to have her in my life. In just a few weeks, she will have a new baby brother. We can't wait to meet him! One of the best things about a love story is that it never ends. It has its own life, its own vibration. That vibration ripples far and wide, blessing everyone and everything it touches. Think about your life: what love story can you tell?